My Oktoberfest recipe for this year! 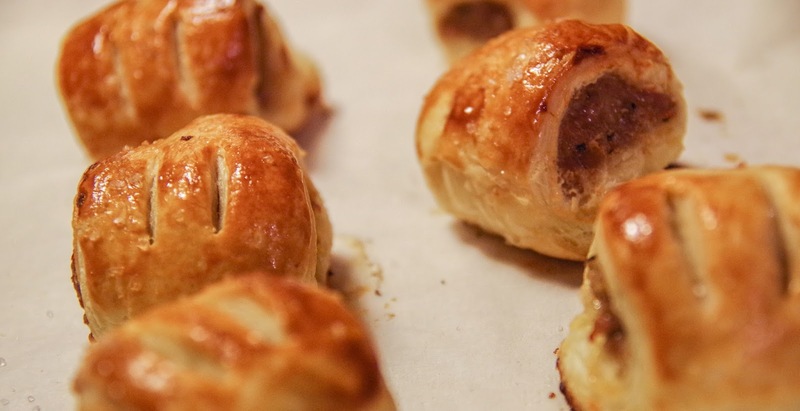 My wife has never been a fan of my original sausage roll recipe unless I take the time to trim all the casings off. This has always seemed a little too time consuming for me, so I don't and she doesn't eat them if I make them for a party. This time I just started with a pound of sausage meat and that made the whole thing much easier. When I was coming up with this recipe I did some research on egg washes and discovered that doing an egg wash with just a beaten egg yolk gets you a deep brown color when baked. When you add a nice serving of large grain salt, it can give puff pastry a pretzel like exterior. Roll out the sheets of puff pastry. I like to use a rolling pin to smooth any creases, I think it makes it easier to roll in the end. Divide the ground sausage into 4 equal portions. 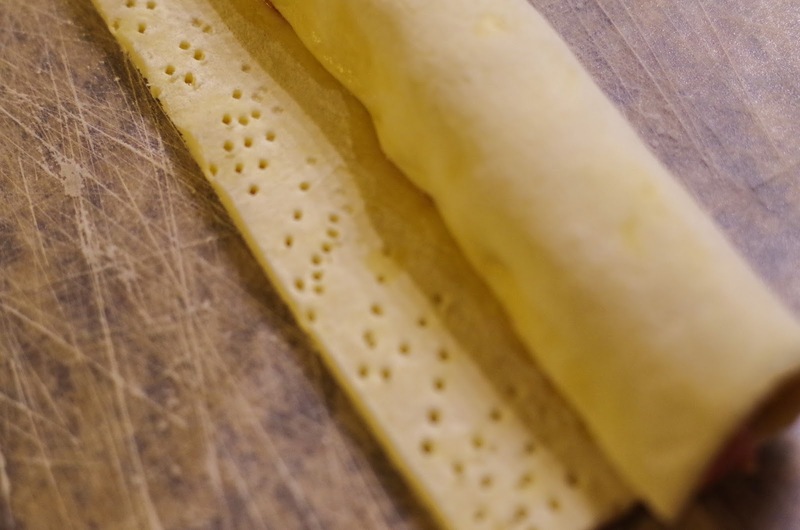 Take one portion and place it on the narrowest edge of the pastry sheet and form into an even log that stretches along the entire edge. Brush the sausage with some of the maple syrup. 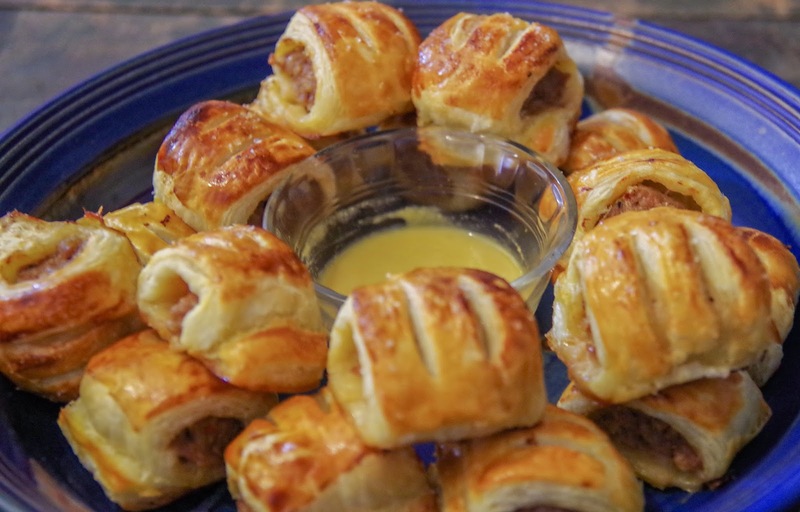 Carefully roll the puff pastry around the sausage and right before the pastry would overlap, brush the bit that would overlap with a little egg yolk to seal it. To make sure the roll has a flat bottom, before I seal it up, I lightly dock, or poke with a fork, the piece that will overlap. This collapses the layers of pastry and keeps them from rising as much. This is mostly a cosmetic decision but I find that it makes the whole batch turn out more even and uniform looking. Cut the roll off from the remaining sheet. Each roll should take half a sheet, feel free to stretch the dough or roll it out thinner if you find that you don't have enough space. Repeat for the remaining sausage portions. 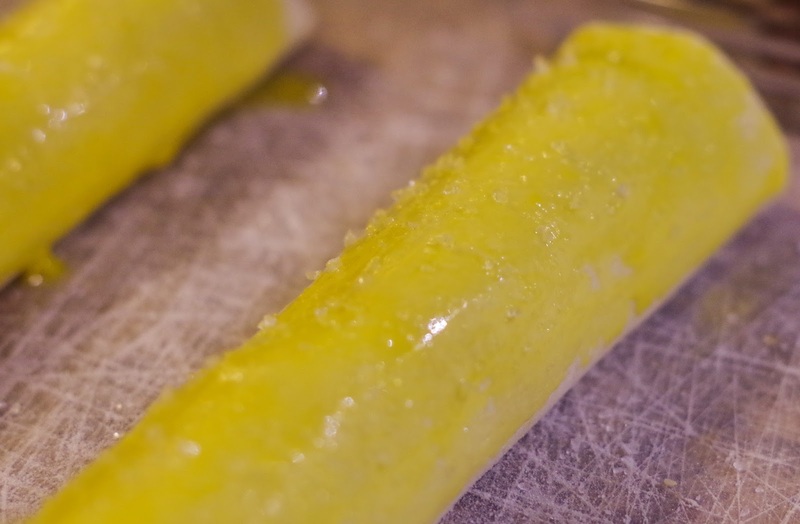 When they are all rolled, lightly brush with the remaining egg yolk and then sprinkle liberally with large flake salt. If you can get pretzel salt, even better. Cut the logs into 6 equal portions. I shallowly score the tops twice with a knife, not deep enough that it goes through the pastry, so that they don't expand too much. Again, this is a personal preference that helps the finished product look nice and uniform. Bake on a greased or parchment covered baking sheet for 15-20 minutes until dark golden brown. To make the dip, combine equal amounts of maple syrup and mustard. Enjoy!